Serena Williams and Roger Federer of Switzerland take a selfie after playing their mixed doubles match at the Hopman Cup in Perth, australia. After nearly two decades of appearing alongside one another on billboards and in record books, Serena Williams and Roger Federer faced one another across a tennis court for the first time Tuesday in Perth, Australia. The stars, now both 37, finally aligned for the first time in a mixed doubles match between the United States and Switzerland at the Hopman Cup team event. Federer and partner, Belinda Bencic, defeated Williams and Frances Tiafoe in an abbreviated Fast4 format match, 4-2, 4-3 (5-3), for Switzerland in 46 minutes. Federer and Williams have won 43 Grand Slam singles titles between them. Earlier, Federer beat Tiafoe, 6-4, 6-1, in the men’s singles before Williams’s 4-6, 6-4, 6-3 victory over Bencic. On the opening point, Williams pulled Federer wide to his forehand side with a sharply angled volley, then sent a smash toward the opposite corner that he could not reach in time to send back. Long exchanges between the two proved few, however, with each using their serve to effectively neutralize the other. It did not seem to matter to the crowd of 14,064 in Perth Arena, the highest single-session attendance in the event’s 31-year history, and Williams and Federer clearly delighted in the chance to hit the ball around with each other a couple of weeks before more serious play at the Australian Open. 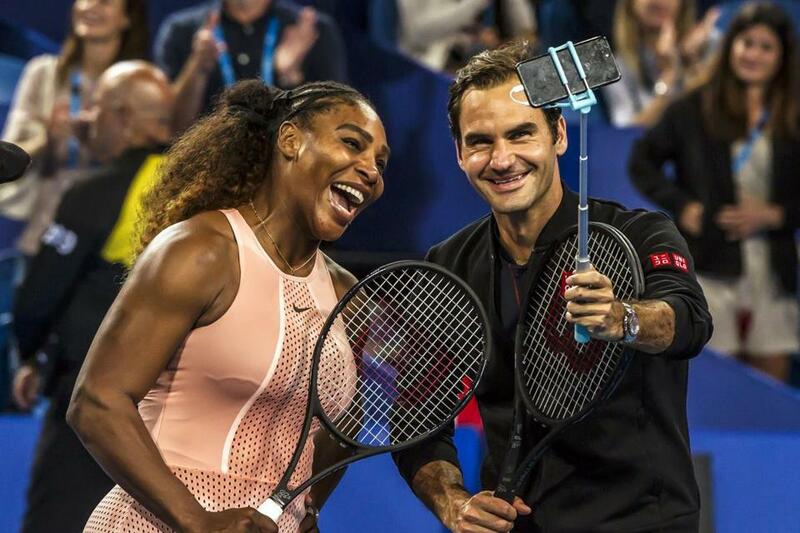 After Williams insisted that they hold rackets during an on-court selfie, they walked back to their seats with their arms wrapped around one another, and Federer said his racket was hers to keep. As she carried it into the players’ area of Perth Arena alongside Tiafoe, Williams stared at the racket with visible wonderment, showing it to her partner and letting him hold it briefly. Andy Murray, 31, returned to competitive tennis for the first time since September and gradually warmed into it, taking the last four games in a 6-3, 6-4 win over wild-card entry James Duckworth at the Brisbane International. Murray had a noticeable limp between points but didn’t show many signs during rallies of strain from his troublesome right hip. ‘‘I want to try to enjoy it as much as I can,” he said. “I'm not sure how much longer it’s going to last.’’ He appeared stiff and rusty to start the match but managed to chase down Duckworth’s chips and drop shots and moved across court well, twice creating forehand winners from defensive positions on important points. A winner of three major titles and a five-time finalist at the Australian Open, Murray is playing on a protected ranking in Brisbane after sliding to No. 240 in a 2018 season in which he finished 7-5 from 12 matches after surgery on his right hip in January. He missed the last five weeks of the season with an ankle injury. In other matches, Nick Kyrgios fired 44 aces and needed five match points before finishing off Ryan Harrison, 7-6 (7-5), 5-7, 7-6 (7-5) in a rematch of last year’s Brisbane International final. US Open champion Naomi Osaka said she felt nervous but kept her cool to beat big-hitting Australian teenager Destanee Aiava, 6-3, 6-2, to reach the quarterfinals. In women’s first-round matches, Johanna Konta ousted No. 3-seeded Sloane Stephens, 6-4, 6-3, fourth-seeded Petra Kvitova beat Danielle Collins, 6-7 (6-8), 7-6 (8-6), 6-3, and No. 8 Anastasija Sevastova had a 6-3, 6-3 win over Daria Gavrilova . . . Venus Williams rallied from a break down in the third set to beat Victoria Azarenka, 6-3, 1-6, 6-3, at the ASB Classic in Auckland, New Zealand, in what she described as one of the toughest first-round matches of her career. Williams, 38, appeared in good form in the meeting of former top-ranked players and Grand Slam winners. She swept through the first set in 48 minutes, breaking Azarenka for 3-1 and, after dropping serve at 5-2, comfortably serving out the set. But the tide of the match changed in the second set . . . Qualifier Monica Niculescu upset fourth-seeded Jelena Ostapenko, 6-0, 6-2, in the first round of the Shenzhen (China) Open. The 99th-ranked Niculescu swept past the 2017 French Open champion in 51 minutes with Ostapenko winning only four points in the first set. Ostapenko had 35 unforced errors and won only two of her 20 second service points. Northeastern’s Tyler Madden scored twice and Jason Robertson had a goal and an assist as the United States closed out the preliminary round of the world junior hockey championship Monday night with a 4-1 win over Finland in Victoria, British Columbia. Northeastern’s Cayden Primeau earned his second win in net and has a 1.50 goals-against average in the tournament. The Americans finished second in Group B behind unbeaten Sweden. When games resume Wednesday, the US team will face the Czech Republic in the quarterfinal round. while Russia plays Slovakia, Canada takes on Finland, and Sweden opposes Switzerland . . . Petra Vlhova took advantage of her height to beat overall World Cup leader Mikaela Shiffrin in both runs of the final and win a parallel slalom city event in Oslo. The 5-foot-11-inch Vlhova was able to cross check gates out of her way with both fists while the more compact Shiffrin, at 5-7, had to maneuver further around the gates. In the men’s race, Marco Schwarz claimed the first World Cup victory of his career when Dave Ryding missed a gate. Ryding was attempting to become the first British skier — man or woman — in the 51-year history of the World Cup to win a race . . . Toronto Raptors point guard Kyle Lowry has had pain-relieving and anti-inflammatory injections for his sore lower back. The team said he was treated Friday at the Hospital for Special Surgery in New York. Coach Nick Nurse said Monday ‘‘things are progressing really well’’ and it ‘‘shouldn’t be too long’’ before Lowry returns. There is, however, no specific timetable. Toronto also said center Jonas Valanciunas had stitches removed from his surgically repaired left hand Saturday. He’s expected to miss at least a few more weeks.